"The Human Rights Organization is the last place anyone would ever expect to find some of the biggest human rights abusers in history." This quote, from the 2003 film Bulletproof Monk, proves that even a silly action-comedy can contain basic truths. The United Nations Human Rights Council contains such human rights beacons as China, Cuba, Venezuela, and the Congo. U.S. Ambassador to the U.N. Nikki Haley called it a "cesspool" in her remarks announcing America's exit, making it the first country to leave in UNHRC's 12-year history. Ironically, the U.N. created the Council in 2006 to replace the U.N. Human Rights Commission, which had become hopelessly compromised by anti-Semitism. But only a year after its inception, the Council singled out Israel as the only country to be a permanent item on its agenda, Agenda Item 7. While critics of the move argue that the United States can do more good by working within the Council, this ignores that after the United States joined, nothing about the Council's behavior changed. Since the United States became a member in 2008, the number of anti-Israel resolutions has even accelerated. According to UN Watch, the Council condemned Israel on 27 separate occasions in its first four years. By 2015, the number had risen to 62. Israel has received more official condemnations from the U.N. than all the world's nations combined. The UNHRC is so predictable in its anti-Israel hatred that those who observe it can announce what it will do before it acts. In May, UN Watch's Hillel Neuer issued the following tweet before the Council's "8th urgent meeting on Israel." He was right on every count. Ambassador Haley warned when she took office 18 months ago that the United States would pull out if it didn't see change. As she said Tuesday, "Regrettably, it is now clear that our call for reform was not heeded." She added: "The world's most inhumane regimes continue to escape its scrutiny, and the council continues politicizing scapegoating of countries with positive human rights records in an attempt to distract from the abusers in its ranks." The problem goes beyond the Human Rights Council. Anne Bayefsky, one of the U.N.'s fiercest critics, gave a devastating critique of the institution in a debate before the Oxford Union Society. Bayefsky lays the blame squarely on the Palestinians and their collaborators. "They have weaponized the U.N.," she said. "They've spent seven decades hijacking and corrupting U.N. institutions in support of their violent, xenophobic rejection of a Jewish State. The U.N.'s failure to fulfill the promise of promoting peace and security and protecting human rights was the predictable casualty." 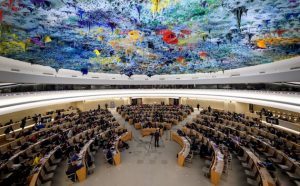 Trump has done a wonderful thing by stepping out of the Human Rights Council. He has strengthened America's moral authority. Given the corruption of so many U.N. institutions one cannot help wonder what he could do for America's moral authority were he to order one more step – outside the General Assembly hall as a whole.